Go to the real cloud, don’t be fooled by ‘cloud-painting’! Considering going to the cloud? Great! But don’t be fooled by the wide variety of services available these days. Cloud services are frequently mixed up with hosting services, or with third party cloud services. The reason behind these misleading offerings are the hosting providers rebranding their traditional hosting offerings with a ‘cloud’ labelled service, or by reselling someone else’s cloud. But exploiting the capabilities of cloud go far beyond what hosting providers offer. True cloud providers use their talent and deep expertise to build and maintain cloud solutions across different premises with multiple levels of redundancy. So, don’t be fooled by ‘cloud-painted’ services. Let me give you five fundamental characteristic that differentiate moving a workload to the cloud versus moving to a hosting provider (or fake cloud provider). Read more about Go to the real cloud, don’t be fooled by ‘cloud-painting’! The future after Cloud and Mobile! Cloud and mobile might look the future, as the world is moving rapidly to these technologies. However, it’s only an intermediate step to the next wave of technologies. Let’s take a closer look on what could be the future beyond today’s promising technologies of cloud and mobile. Cloud Computing is a delivery model of technology, where the use of information technology is provided over the internet. This enables users to access technology-enabled services from the internet (‘in the cloud’) without knowledge of, expertise about, or control over the technology that supports them. As described in my previous publications, cloud computing is the third wave of computing, characterized by two developments: (1) consolidation of technology, and (2) sharing of resources among different users/applications on the same platform. This results in less infrastructure, software, and consequently lower operational costs. The industrialized delivery model of cloud turns technologies into a commodity. 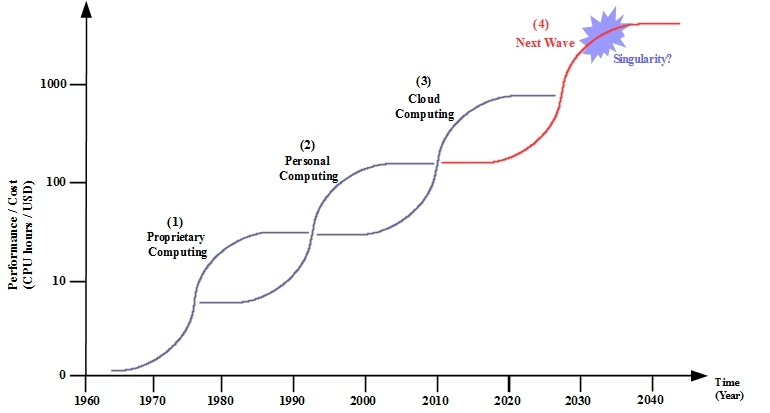 If we look to the graph I used before, you might ask yourself if cloud computing is going to be the ultimate and final delivery model of information technology. Or, what’s the next shift in technology that’s going to trigger a new wave with associated superior increase in performance versus costs? Read more about The future after Cloud and Mobile! Cloud Dominates! Happy new Cloud Year 2015! Traditionally Infrastructure as a Service was realized using a virtualization technology, thus requiring a hypervisor, consequently the infrastructure offered were virtual services. This was very scalable, efficient and flexible, but created a lot of unnecessary overhead in terms of performance and costs. An innovative way of providing Infrastructure services is Bare-metal cloud, offering a dedicated environment delivered in very scalable, efficient and flexible way. Through a web-based portal or an API these cloud services can be provisioned and de- provisioned in an easy way. A major player in the market of bare-metal cloud is SoftLayer. Bare-metal cloud servers offer a superior performance with low latencies at a lower cost compared to a virtual server. Even better, a single bare-metal cloud server can carry the load that would require multiple virtual servers in a virtualized cloud environment. A multitude of workloads benefit from bare-metal cloud servers, some examples are data analytics, scientific simulation algorithms, media rendering, and gaming application. Read more about Cloud Dominates! Happy new Cloud Year 2015! Hi there! It has been silent for a long time on my blog, my apologies to my readers. 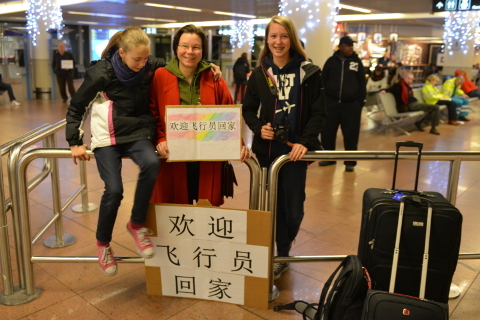 Upon my return from China in November 2013 I decided to take a few weeks off and enjoy family life. Beginning of January 2014 I went skiing. Disaster did strike, I scattered my femur bone in a severe accident. It took months to recover with massive amounts of pain killers, whereby I had no energy to blog. I had to use my time for daily exercises, to rest, and in between spending quality time with family and friends. Finally, nine months later, and after another surgery in September I was able to start learning to walk again. The last surgery of December was a set-back, but it’s going in the right direction. So far, it has been a steep recovery, something I didn’t expect. 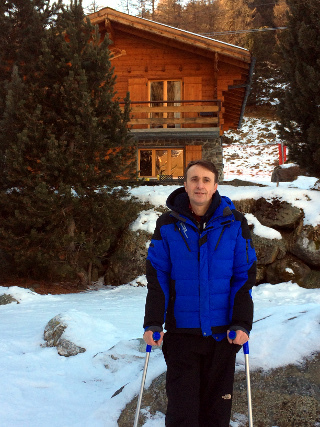 And, though I still need a long time for a full recovery, I give it a trial …. to be back! So, stay tuned! Read more about Hi, I’m back! If hope you enjoyed reading some of my blogs over the past weeks. Feel free to leave a comment on the bottom of this blog. This is the last blog in this sequence, I am back at home! But, I gained a wonderful 45 days lifetime experience, met great people and made new friends, have a heart full of great memories, have a drive with 120 GB photo and video to sort out, and I did not got sick! I would like to take the opportunity to conclude with the following words of thanks. Christine: thank you for supporting me in joining the CSC program, and for encouraging me make a travel dream going to Tibet come truth! Read more about Last day – My final messages! Back home! Good morning day 45! It's very early in the morning, actually it is still yesterday in Europe and US. Today is my travel day back home, tomorrow I will be back home in Belgium. I leave very early for a boring journey: taking taxi, hanging around in airports, waiting, and flying (departure expected 01:35) … you probably know how boring this can be. So, when you are reading this I will be on the road now, do not expect much news today! Except for a question I got a few times and for which I prepared the answer: How did you make all these nice photos? There is no big secret. 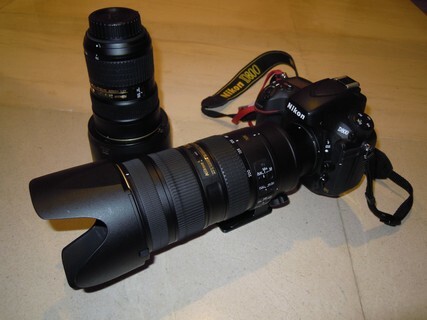 Years of practice and using my camera, it is a full frame DSLR camera with two of worlds’ finest lenses. They are too heavy, they are too expensive ... but every photo I shot was a real pleasure, even in extreme light conditions. I enjoyed making them; I hope you enjoyed watching them. Tomorrow will be my last blog post about my journey, stay tuned! This morning I packed my luggage the last time for this trip! Tonight I will leave to the airport and early in the morning I will start my return home! 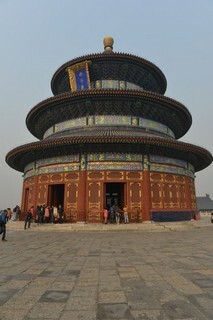 I left my entire luggage at the hotel and went to the Temple of Heaven by taxi. 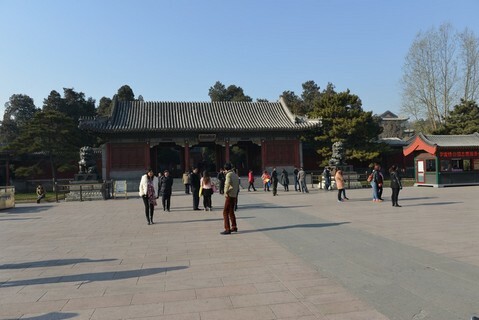 It is a nice park area south of Tienanmen Street with different small temples and shrines. Nice area, with many Chinese exercising and dancing, but the air was so ugly. Again, I witnessed how street vendors are trying to rip off foreigners. A guy selling toys jelled ‘er shi Yuan’ (which means 20 RMB) and when I passed along he said in English ‘one-fifty Yuan’ (150 RMB), thus 7.5 times more expensive. I told him that ‘er shi Yuan’ in English is twenty Yuan, not one-fifty Yuan. He was speechless. Chinese men vs. me: 0 – 1! I walked through the entire park and left through the west gate. Afterwards I strolled back via Tienanmen Street, Tienanmen Square, and along the Forbidden City back to the hotel. Back at the hotel I had some time to update my today’s blog post before leaving! 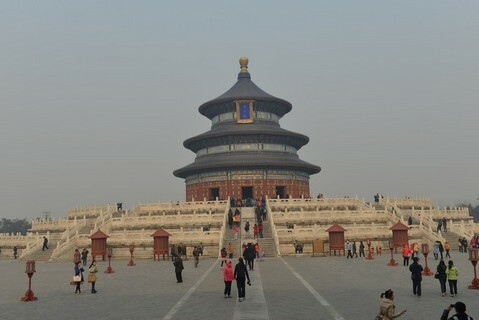 Enjoy the last photos of Beijing! 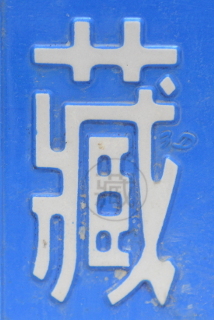 Read more about Day 44 – My last day in Beijing, me vs. Chinese : 1 - 0 ! Back in Beijing, first thing in the morning was going for a great 'Americano' at Starbucks in front of the hotel! 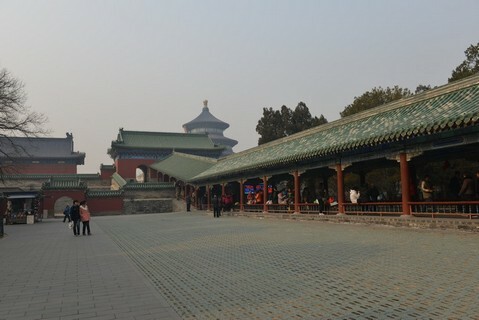 A 50 min taxi drive to the north-west brought me to the Summer Palace, a huge area with temples, gardens, pavilions, lakes, bridges, gate-towers, etc. It was a real tourist attraction with many foreigners walking around. 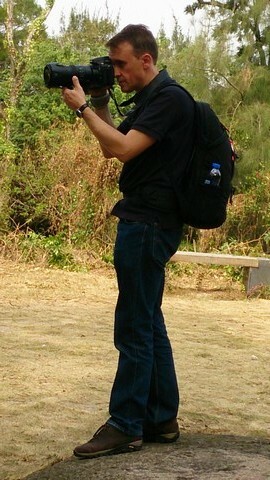 It was a long time ago that I saw so many foreigners. It was nice to walk around in the parks, but the air outside was very ugly, in particular compared to the clean air of Tibet. 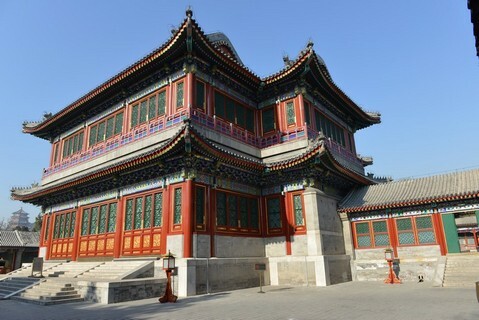 After the Summer Palace I went to Beihai Park, just north-west of the Forbidden City. It is a park around a large lake with in the middle of the lake an island. On the islands stands a temple with a remarkable 36 meters high Tibetan-style White Dagoba. From the top you can watch over the city and I saw how the ugly smog was hanging around. It was clear why I suffered from breathing this air! Back at the hotel … time to start thinking about packing luggage. Read more about Day 43 – Suffering from smog in Beijing! Today I left Tibet behind me, this morning my driver and guide picked me up and after a 1h20m drive we arrived at the airport. They have taken good care of me (they probably had no other option otherwise they would have been in trouble), so I gave them their tip and the time had come to say goodbye! Thanks guys! I checked-in and passed security at the airport, I felt free! Walking around at the airport I was like a tourist attraction, being the only no-Chinese walking around this time of the year, as almost all tourists come during summer. Whilst waiting at the airport it was time to look backwards on these eight days and pencil down some reflections. The landscapes were breathtaking, the people were friendly, the weather was nice (cold and clear), but the roads were long. It is hard to believe how people survive here, small children must take care of the baby yaks, youngsters working or taking care of the sheep’s, women carrying heavy stones on their back, people walking miles and miles along deserted roads, unheated concrete houses without any kind of modern comfort, people wearing old and dirty clothes, disgusting shared toilets, etc. The contrast with our standard of living is enormous. The rough landscape and awful climate must make it far more difficult for these people compared to other poor countries I have visited before. But every time when people looked at me a big smile came to their face. Looking at their shining eyes and smiling mouth with dark brown teethes you could see their internal happiness. I was very happy to bring my own down sleeping bag. The rooms were ‘clean’ and ‘heated’, but again far different from what we are used to. Towels and blankets are worn out, grey-yellow colored, and stained. Washing must be far more difficult and definitely without using whitening detergents. The standards are far below our snow white towels and blankets in perfect condition. 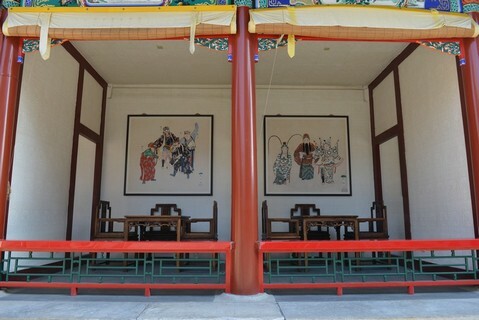 The heating in the rooms were sufficient to eliminate the cold, but the ways the buildings are constructed make it impossible to hold the heat inside the room. That’s why people always walk around with thick coats, even inside. Having my own down sleeping bag was a big comfort; it was always clean and warm. 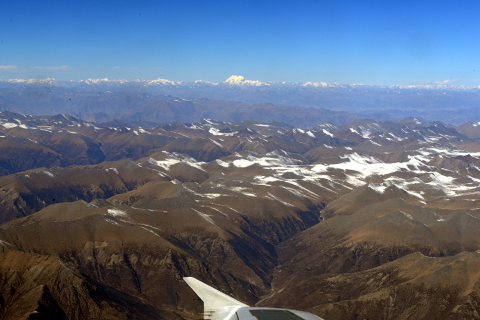 The flight from Lhasa took me back to Beijing. Six weeks ago I landed in Beijing and arrived at Terminal 1, last week I arrived at Terminal 2, and indeed … this time I arrived at Terminal 3! Back in Beijing it took a long taxi ride back to the hotel where my luggage was waiting for me. After check-in Laura was waiting for me. She arranged the drivers the previous time I was in Beijing. Now she took me through Houhai (see day 33), this time I had my camera with me! Read more about Day 42 – Bye Bye Tibet, back to Beijing! 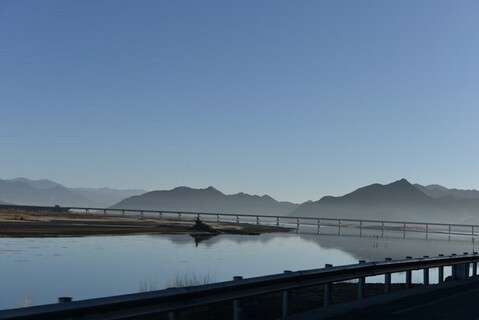 Again a long ride, 7 hours driving for 400 km, until we reached Lhasa. The road follows the wide east-west oriented valley. 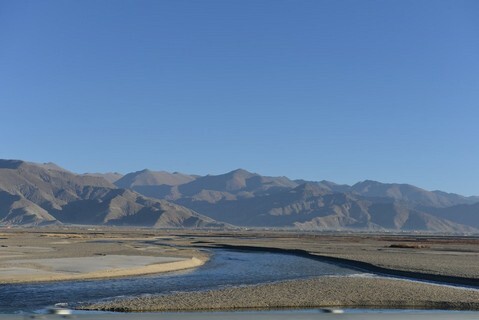 We drove along the Yarlung Tsangpo River. 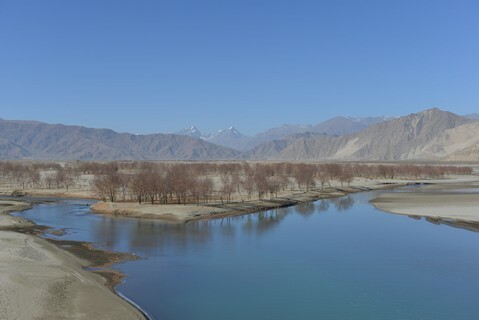 The river originates at the Tamlung Tso Lake and goes all the way to India, where it becomes a holy river. The road is in very good condition, but the speed limit keeps the travel speed low. At every checkpoint the driver receives a note with the departure time at the checkpoint. He must adjust his speed to avoid being too early at the next checkpoint. From time to time he stops a few curves before the checkpoint to gain some time. 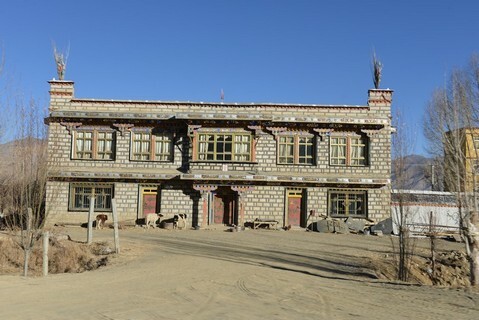 Back in Lhasa I went to the small Palubuk nunnery near the Potala Palace, my last visit in Tibet. Totally exhausted I arrived at the hotel. Having time to catch-up my blog, although not much happened today. Tomorrow I leave Tibet going back to Beijing. Two checkpoints to go and I will be free! Enjoy the photos!